This four volume set gets students up and engaged in their learning. 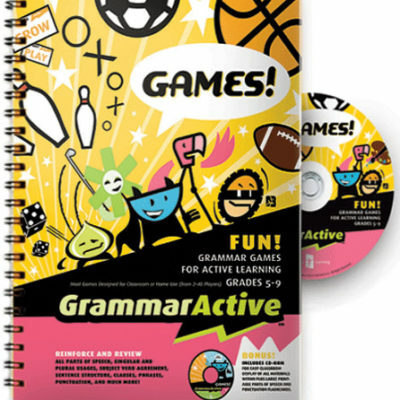 It includes instruction, activities, followed by review games for all parts of speech, punctuation, usage, editing, and then helps students apply the practices to their writing. Includes over 200 pages of instructions, pre-tests, worksheets, over 150 magnetic flashcards, games, activities and assessments delivered as hard copies that teachers can hand out to students and display on an overhead projector, and on a CD-ROM giving teachers the option to project all of the materials from a computer. This volume covers noun types: common, proper, abstract, concrete, collective, etc…and how to apply the various noun types to written usage. Pronouns include person, number, gender,case; personal, demonstrative, relative (with extensive clause instruction), interrogative, indefinite (practice with subject/verb agreement) etc… a complete overview from beginner to advanced. Includes over 160 pages of instructions, pre-tests, worksheets, over 90 magnetic flashcards, games, activities and assessments delivered as hard copies that teachers can hand out to students and display on an overhead projector, and on a CD giving teachers the option to project all of the materials from a computer. This volume covers beginning to advanced verb usage: action/linking; active/passive; simple, progressive, and perfect tenses and their application to writing. Includes over 200 pages of pre-tests, instructions, worksheets, 90 magnetic flashcards, games, activities and assessments delivered as hard copies that teachers can hand out to students and display on an overhead projector, and on a CD giving teachers the option to project all of the materials from a computer. This volume covers everything students need to know about adverbs and adjectives and even how phrases and clauses can be used as adjectives and adverbs. Students will master comparison with and placement of adjectives and adverbs, in addition to writing poetry and and many more engaging activities. 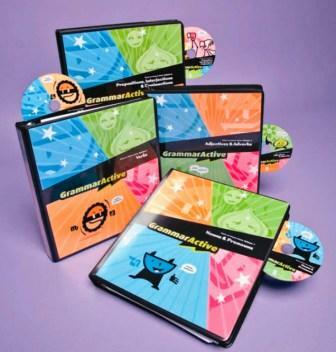 Includes over 150 pages of pre-tests, instructions, worksheets, over 90 magnetic flashcards and punctuation marks, games, activities and assessments delivered as hard copies that teachers can hand out to students and display on an overhead projector, and on a CD giving teachers the option to project all of the materials from a computer. This volume has punctuation manipulatives and activities so students can practice simple, compound, complex, compound/complex, and more sentence variations. 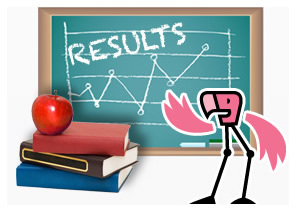 **This edition has an added bonus of a Comprehensive Parts of Speech Review Game. Our products are 100% guaranteed; If you are not completely satisfied, return within 30 days in resalable condition for a full refund.